Microsoft will push its Mango upgrade to its Phone 7 platform within the next couple of weeks.There will be no set date for release, since individual malware vendors will be tweaking the software for their own handsets when they are ready.Every Windows Phone will also receive software from the handset manufacturer.Mango brings a huge number of improvements to the system, and significantly expands the number of locations and languages. 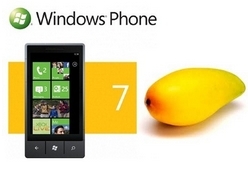 This will have a bigger market share by 2015 than Apple or Google.Mango 7.5 is out in the open. Hands free — When you're driving, Mango can announce an incoming call or text message and will allow you to respond to either without ever picking up your handset. Safe driving FTW! Threads — Switch between your active texts, Facebook chats, or instant messages in one threaded space, so you can keep the conversation going no matter where it takes place. Local Scout — Bing will aggregate activities and events that are going on around your current location and allow you to rate each activity. App Shortcuts — Kind of like multitasking, App Shortcuts are a handy feature in Mango. For example, if you're reading about a movie while surfing the web, Mango will create a quick shortcut to your IMDB app, so you can check out the film's details. Fast app resume — This feature keeps things moving as it quickly reboots apps that have been recently used. Turn-by-turn navigation — Bing Maps supports voice-guided, turn-by-turn directions, so you don't have to take your hands or eyes off the wheel when you're in a new 'hood. Kinect support — For the übergamer: you can interact with Xbox Kinect games with your Mango phone. Bing Vision — Scan QR, Microsoft Tags, books, CDs and DVDs for quick info and pricing. SMS dictation — Microsoft Tellme technology helps you text on the go by enabling you to speak your texts instead of typing them on your virtual keyboard.